How many times have you walked into a new restaurant, taken a cursory glance at the menu, and immediately known which dish you want? Sometimes the act of picking your meal is akin to a gut feeling, like some kind of instinctual cry for sweet and sour chicken, BBQ pulled pork, or the classic American burger. In reality, though, there may be more to your dinner-time craving than that. In fact, your suddenly insatiable desire for that juicy, mouthwatering appetizer—a course that you didn’t even think you wanted—may have been sparked by a well-designed menu. It may sound strange, but the content and design of a menu can have a significant impact on a customer’s dining choice and overall experience. As a restaurant or bar owner, then, your menu represents a wonderful opportunity to improve your business in almost every way: your branding, your memorability, your customer satisfaction, and ultimately your profits. Does the menu really matter? Restaurant 101: Does the Menu Even Matter? The short answer to this big-league question is, of course, yes! Otherwise we’d have nothing to say about your menu, and every restaurant in town would just throw something together in Microsoft Word and call it a day. So, of course, the menu does matter… but why? Your menu will be seen by 100% of the people who come to your restaurant, all of whom are there with the specific intent of purchasing something from you. 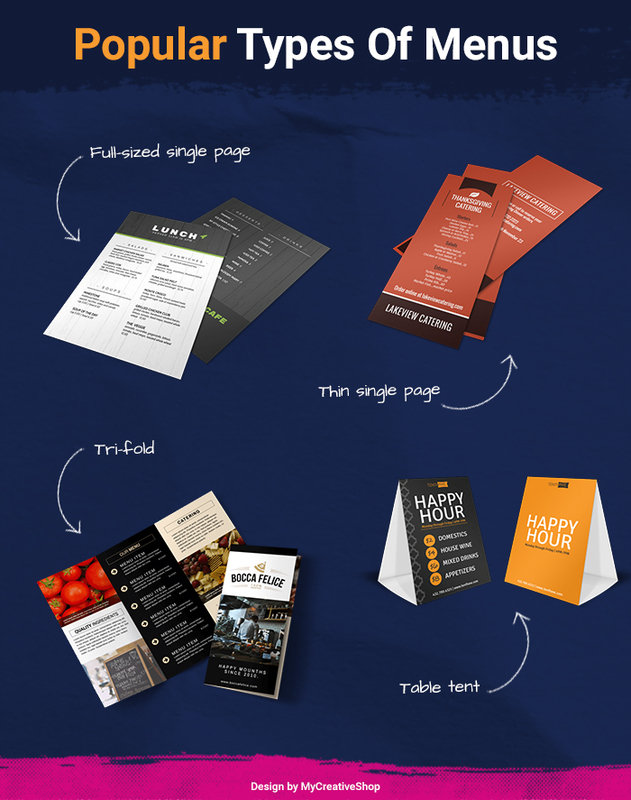 Unlike virtually any other type of marketing collateral, your menu has guaranteed visibility. You don’t have to seek out your target audience or spend tons of money getting your menu out there; you literally have people lining up to view it. That level of consumer attention is almost unparalleled among any other marketing or branding effort! Because your menu will be placed in front of a self-selected, purchase-ready audience, the majority of the work is done for you. All that’s left for you to do, then, is tailor your menu so that it connects with, informs, and satisfies your customers. And that’s what we’ll be diving into next: specific tips and guidance for more effective menu content and design. At first glance, the content of your menu might appear painfully obvious. After all, what we’d call “menu content” is just your dishes, right? All those appetizers, main courses, add-ons, and beverages? And to some extent, that is true. The most critical content on your menu will absolutely be what you’re serving to your customers. Even the most well-written, beautifully designed menu won’t help if your dishes are fundamentally unappealing to your target audience. 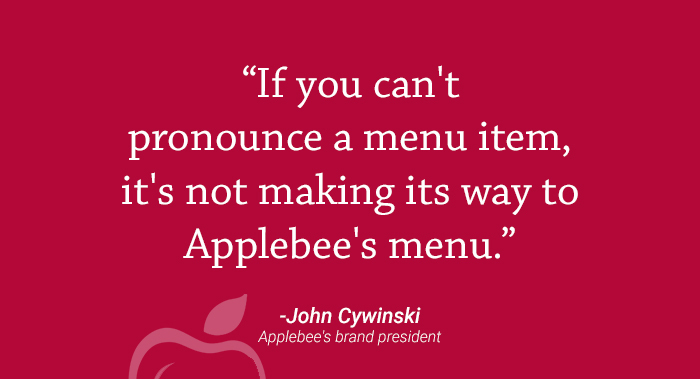 If you’re interested in the fit between menu offerings and target audience, check out the 2018 menu reorganization at Applebee’s. We won’t spoil the whole story... but it’s an interesting case study in how serving the right dishes can lead to a huge uptick in profits. So when we say “menu content,” we’re focusing not so much on what you’re serving, but how you’re presenting it. Having phenomenal content won’t make up for lackluster dishes… but it can take solid, well-prepared dishes and turn them into something your diners are dying to try. Here are four tips for writing more attractive, informative, and profit-driven menu content. 1. Name your dishes well. What’s the difference between naming your dish Chicken-Fried Steak and Grandma Greta’s Famous Gravy-Smothered Chicken Fried Steak? One sounds boring—like something on a months-old grocery list—and the other is evocative of a juicy, handcrafted, delicious meal. One is instantly forgotten, and the other leaves an impression on both the mind and the tastebuds. Use nostalgia. The best marketing techniques always tell a story, and your restaurant dishes are no exception. Your diners will form an emotional connection to dishes that tell your story and evoke shared ideas of family, childhood, and comfort food. Write in your brand voice. Throw in some branding-specific language to make it clear that this dish is truly yours. For instance, if you’re a beachfront eatery with a focus on easy living, add some casual beachy jargon to some of your dish names. Be clear. Above all, every dish name should adequately describe what the dish is. It doesn’t have to list every single ingredient, but the reader should be able to see the name and immediately discern whether it’s a casserole, a salad, or an ice cream sundae. 2. Describe your dishes specifically. Beyond the title, the second component to any individual dish on your menu is its description. Because the description is longer than the title, you have more opportunity to describe the contents of the dish—and drive your customers’ desire for it. Ingredients. Simply put, what’s in the dish? List all primary ingredients, major flavor profiles, alcohol (if any), and common allergens. Cooking method. How is the dish cooked? For clarity, stick as much as possible to commonly understood keywords like baked, braised, pan-fried, deep-fried, etc. Key taste descriptors. What is the main flavor? Is it tangy, sweet, savory? It’s also a good idea to note any particularly “love it or hate it” flavors like cilantro or star anise. Geographic origin. Diners today care more and more about where their food is sourced. If your dishes incorporate fresh baby kale from Your Local Family Farm, say it! Local touches. The hyper-local trend doesn’t just extend to ingredient sourcing. You can also connect with customers by throwing in references to popular landmarks, local legends, or fun tidbits of town history. Evocative language. Don’t be afraid to use adjectives to describe how the dish tastes, smells, or feels. The more descriptive you can be, the more your customers will envision themselves savoring that dish. 3. Leave out the dollar signs. This tip could really fall under content or design, but let’s go ahead and look at it here. 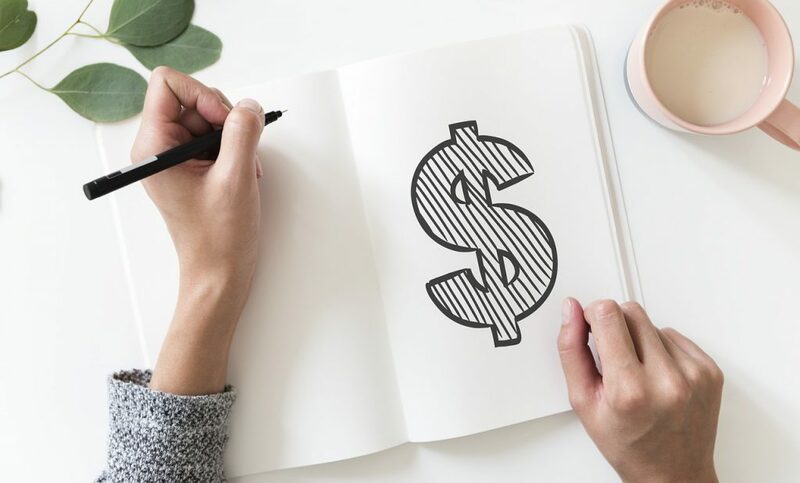 However, you should keep in mind that these conclusions were drawn from a single study, and there’s not nearly enough evidence to say that you must leave out the dollar signs. 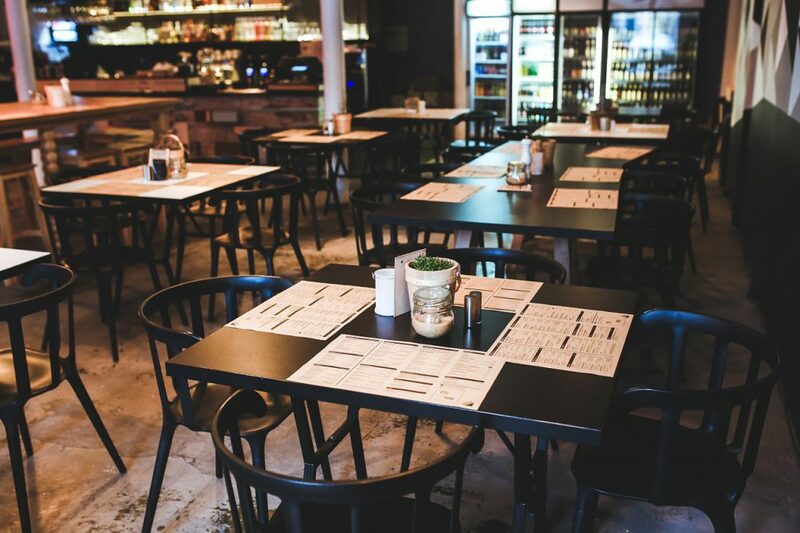 If you’re looking for a new strategy to try, or if a lack of dollar signs happens to suit your restaurant’s modern minimalist aesthetic, it might be worth a shot. 4. 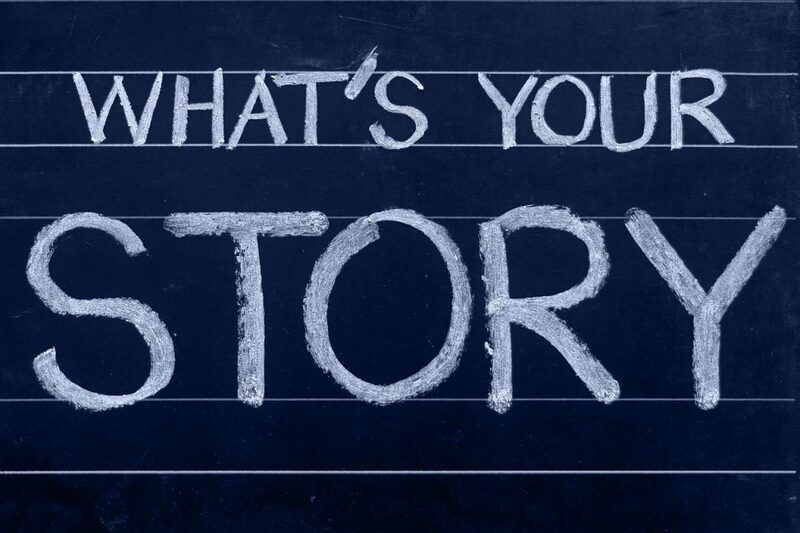 Tell your restaurant’s story. As you write your menu content, you should remember what it is you’re actually doing. You’re not just listing the dishes that your chefs have imagined or the cocktails that your master bartender has crafted; you’re forging a connection—and, hopefully, a lasting relationship—with your customers through food. To do this effectively, you need to engage with your customers on an emotional level. In addition to your unique dish names and descriptions, consider having a short block of text (maybe on the front or back of your menu) that simply tells who you are. Use this space to share your origin story, your philosophy, your cooking methods, your sourcing practices… anything that sets you apart and gives your customers something to come back to. Your food is certainly important, but so is your story! 1. Choose a menu style. Full-sized single page menus: A versatile option for restaurants with a small or large selection. Both sides of the page can be used, and multiple pages can be arranged in a booklet if you have a particularly large menu. Thin single page menus: Perfect for wine/craft beer lists, take-out menus, food trucks, or fast-casual eateries with a limited number of dishes. Tri-fold menus: Another versatile option that provides enough space for a wide selection but also provides natural divisions of space for different categories of dishes. Table tent menus: Good for advertising daily specials or limited-time dishes, but may look too “cheap” for fine-dining restaurants. You’ll also have to decide whether you’d like to use one menu for everything or several menus for different types of items. Again, there’s not necessarily a best practice for this choice, but you should definitely make it with your customers in mind. 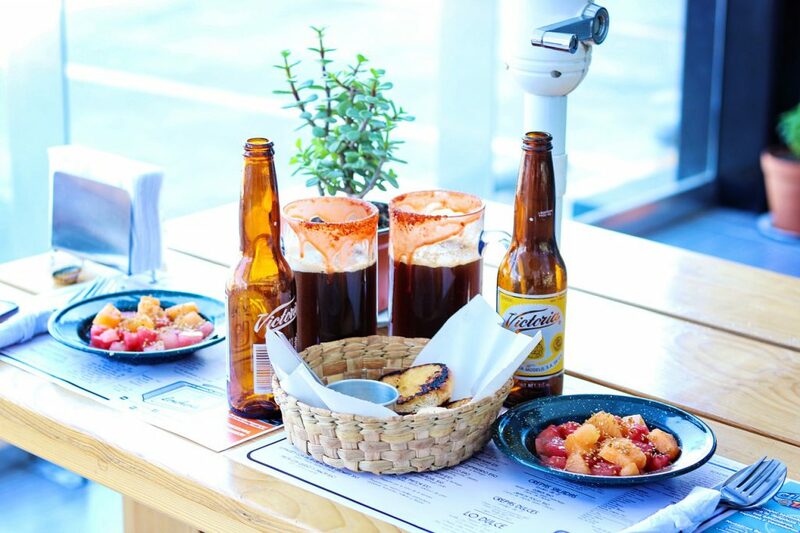 For instance, a separate drink menu can be left at the table as your customers dine (likely driving more beverage sales over the course of the meal), and a separate menu for seasonal specials can draw instant focus to those dishes. However, offering too many menus can become overwhelming and confusing for your customers, forcing them to make a quick choice just to get the clutter out of the way. 2. Order your dishes carefully. Based on the type of menu you’ve chosen, you’ll next need to decide where to place the dishes. 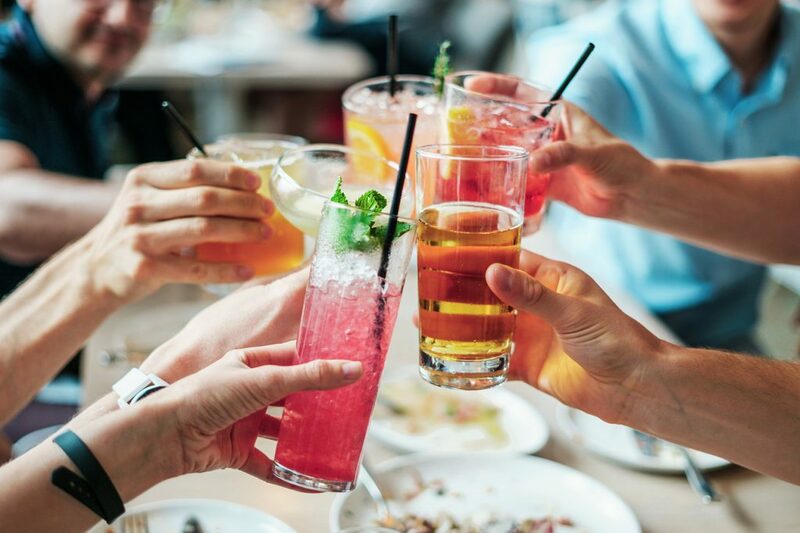 It may seem unimportant, but the visual layout and ordering of your dishes can actually have a strong influence on what your customers choose to eat or drink. Use the Golden Triangle. The “Golden Triangle” refers to the three areas of the menu on which diners’ eyes settle on first: the middle, the top right, and the top left (in that order). You should place your highest-margin dishes in these areas. Place high-profit dishes first. If you follow the Golden Triangle Rule, you’ll likely be doing this already… but be sure to place your highest-margin dishes in the first two spots of any category (such as Appetizers, Main Courses, Seafood, etc.). These are most commonly ordered by patrons. Center-align your dishes. Some restaurant consultants recommend aligning dishes to the center of the page with the prices listed below. This prevents customers from easily scanning the prices and then making decisions based more on price comparison than actual desire. 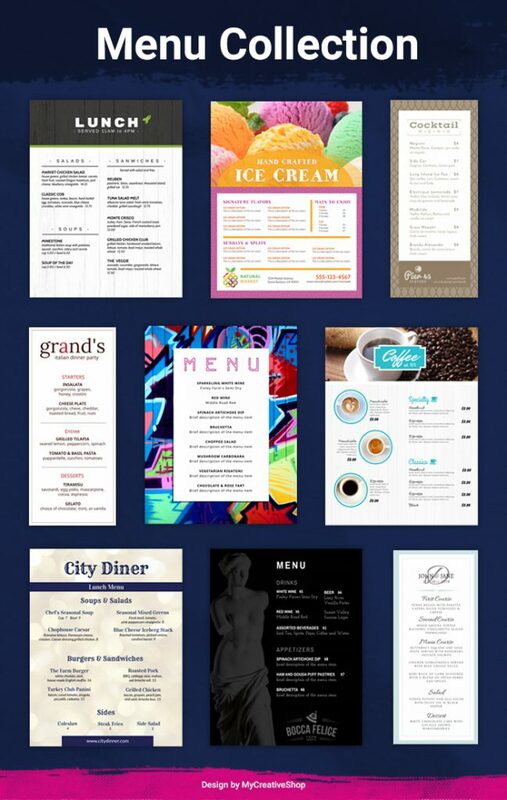 If you search the internet for menu layout recommendations like these, you’ll find tons of articles with flashy names like “10 Crazy Tricks Restaurants Use to Make You Spend More!” But in reality, these design tips aren’t some kind of trick. Although we do believe there are secrets that every restaurant owner should know, the goal is never to trick your customers. After all, you aren’t making them order something they don’t want, and you aren’t tricking them into paying more. You’re simply using effective design to help your customers make the most satisfying decision. 4. 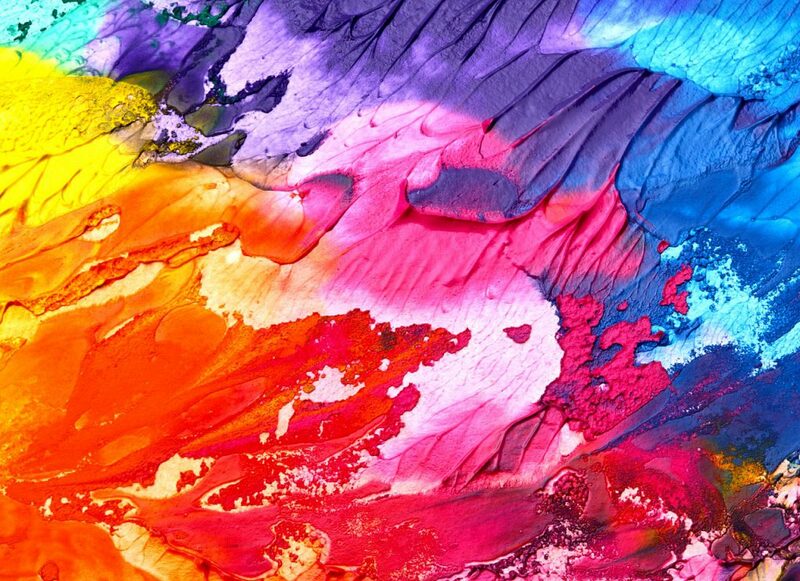 Use color theory and design elements. What distinguishes a boring, low-effort menu from one that looks professional and attractive? Typically, it’s the careful use of design tenants. After all, every menu is essentially a list—it’s just that some look better and are easier to read! You’ll boost the appeal and practicality of your menu by taking advantage of these tenants in color theory and visual design. Green implies freshness and health, and it’s often used to denote vegan or vegetarian dishes. Red stimulates the appetite and connotes energy and passion. Orange is also related to high energy and signifies good value. Blue is known to suppress appetite, so it’s usually not the best menu choice. Call-out boxes, for example, are a great way to highlight certain categories of food or even specific dishes (usually those that are high-profit or particularly unique). Your call-boxes might each use the same font, display a high-quality picture, and list a rave customer review or interesting description. A good rule of thumb is to have at least one or two items per page that are graphically set apart in some way. This will give your customers a nudge as to which dishes are popular or provide especially great value for their money. 4. Don’t be too clever. Although you’re definitely free to make use of creative design elements, it’s important not to stray too far from the primary purpose of a menu. We recommend avoiding overly clever or unexpected designs in favor of clear, easy-to-read menus with a familiar layout. Your customers shouldn’t have to work hard to find the appetizers, main courses, or drinks. 5. Express your restaurant’s personality! Are you a fast-casual chain with an emphasis on heart-healthy, meatless dishes? A homestyle Italian joint that still makes meatballs the way Nonna did? A traditional ice cream parlor with surprising twists on classic flavors? Whatever your food or beverage niche might be, your menu should fit seamlessly into that bigger picture. Always evaluate your choice of fonts, photos, and colors with an eye toward your overall brand identity, target audience, and level of formality. After your content has been refined and your design selected, it’s time to combine those elements into the final product: an eye-catching menu for your restaurant or bar. 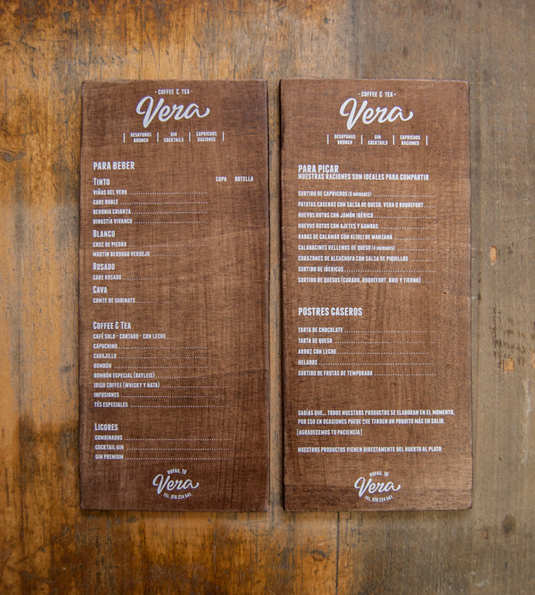 As you finish up your menu design, check out these final three tips for an effective menu! 1. Choose right menu material for print. Similar to your languaging and overall design, the material you choose for your menu should reflect your restaurant’s brand and identity. Whether you go with plain matte card stock or laminated paper inside a leather-bound booklet, make sure that the material fits in with your restaurant’s theme and reflects your brand story. 2. Test out your menu. If at all possible, it’ll be worth the effort to test your menu—in person, in real life—before committing to the final design. By doing so, you’ll be able to see how well your menu reads, looks, and performs under the actual conditions of your restaurant. Say you’re a fast-casual restaurant where people view menus as they wait in line. Are the menus easy to hold (especially with a purse, child, or other important item in hand) and view from a distance? Say you’re a downtown bar with a hip, speakeasy feel. Are your cocktail menus legible in low light? Is the font large enough and the color contrast high enough to be read under dim bar lighting? Say you’re a local Tex Mex restaurant that serves freshly fried tortilla chips as your customers make their dinner selections. Is your menu easy to sanitize between uses? Say you’re a fine-dining establishment with cozy, intimate tables. Is your menu small enough to be viewed without crowding the table setting or knocking off the wine glasses? 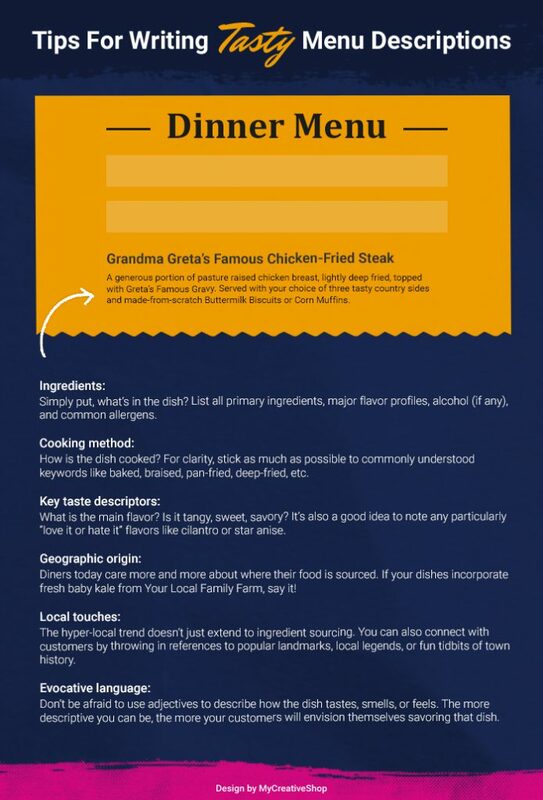 Remember: although your menu is definitely a piece of marketing material, it’s still primarily functional. The easier it is for your customers to read and use, the better experience they’ll have in your establishment. 3. Integrate your menu with the rest of your marketing strategy. One of the biggest mistakes that restaurant and bar owners make is assuming that the menu is finished as soon as it leaves the printing press. If you all you do is design and print a new menu, you’re missing out on some huge marketing opportunities! Put your menu online. Add your new menu to your restaurant’s official website, Facebook page, Google My Business profile, and all review sites on which you’re featured. If possible, don’t just upload a PDF; make sure it’s an actual web page so at that you can reach the 50% of users who browse from mobile devices. Make your menu visible. Visitors to your restaurant will definitely see your menu, but what about people around town? As much as possible, try to bring your menu into the community. You can put up a menu sandwich board outside, give takeout menus to nearby offices, or post on local ad boards. Train your employees on the menu. Nothing is more frustrating for a diner than asking your waitstaff a menu question that they can’t answer. Take time to train your employees on the menu, along with some tips and tricks to encourage diners to try new items. Inspire customer engagement. Try to view your menu as an active tool for customer engagement rather than a static list of cocktails and main courses. 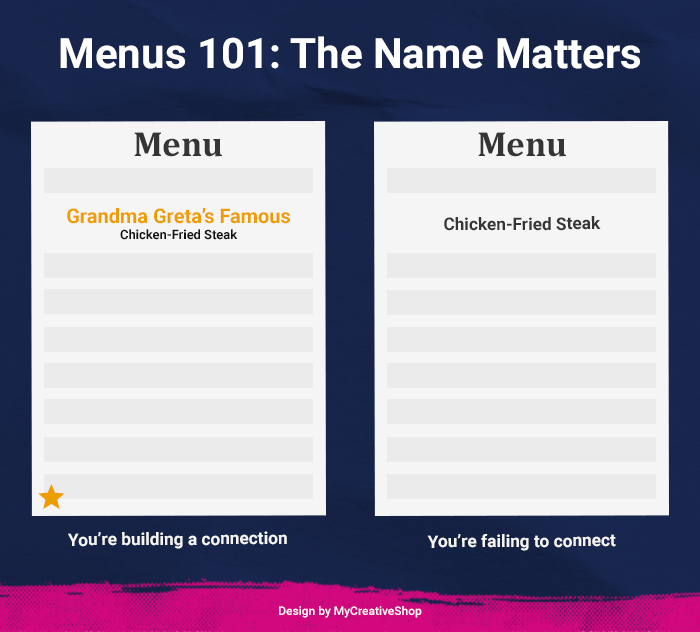 Your menu can be a great jumping-off point for both in-person and social media conversations, so include your customers through fun activities like dish naming contests or secret menu challenges. It tells your brand story. It builds an emotional, memorable connection with your customers. It drives customer desire for your food and drink. It encourages diners to make the most satisfactory choices—for you and for them. Above all… it makes you stand out. Whether you’re starting from scratch or re-working an outdated design, the effort you put into optimizing your menu will definitely be worth it. If you need some help getting started, go ahead and check out our menus! We take the work out of menu design and printing so that you can focus on wowing your diners with mouthwatering meals. Originally from Houston, TX, Andrea Schlottman has been professionally writing and editing since 2010. Andrea is passionate about helping businesses attract, engage, and convert more customers. When she’s not putting words on the page, you can find Andrea with a book in hand, exploring as many new countries as possible. Print or share them anywhere.